I’m a late bloomer, I thought for ages that I’d do something different each year of my life. Shoemaking and now shoe designing is the first thing that’s really taken me for everything I’ve got. Designing has always been an activity I’ve participated in kindergarten it was my underwater glass dream house in College it was studying Fashion in Paris but it wasn’t till I started actually cutting leather that I truly began walking with clear direction. When I design it comes from a place of desire for something for myself. My whole life I’ve been completely dissatisfied with shoes, beautiful and uncomfortable, adversely, ugly and comfortable too often are paired and I aim to change that with Dopp. 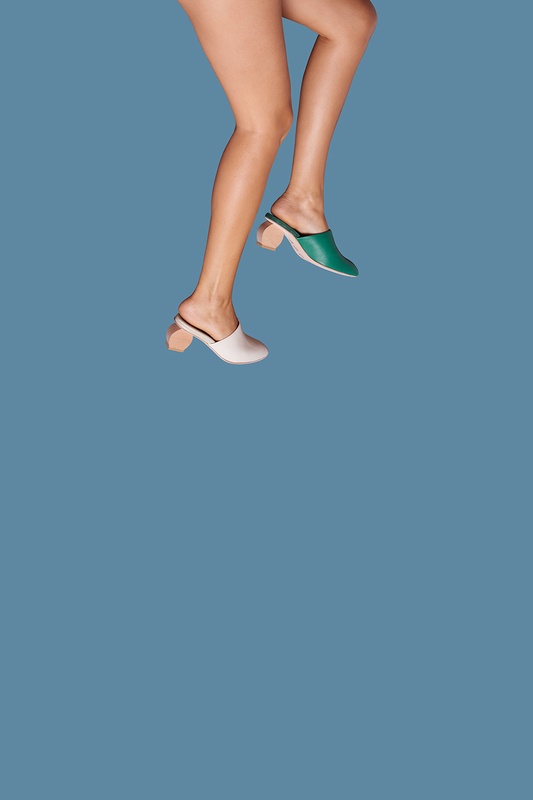 DOPP is a playful, high end, women’s shoe brand made by hand in Los Angeles, CA with the finest leathers and care. In a cafe with a friend on a napkin 15 years ago we sketched out our logos for our future businesses, it took a very long time to take that first step for me. In 2016 I studied at the Shoe College then in Jerome, Arizona and I’d walk after my lessons up the cliffside of the ancient mining town and the smell of leather was on my skin in my hair and roses were in bloom all around me and it just had the most magical feeling of finding my treasure. Of course then it’s been a super rocky ride of doors slamming in my face and old men telling me what I wanted to do wasn’t possible, haha. After working within a tiny container for a year on wild prototypes and experimental methods I began the search for a factory in LA to turn the hobby into a business. Dopp was founded in August 2017. I saw a Richard Tuttle interview at the SF MOMA years back where he first wowed us with his art and then charmed the audience nearly to tears of joy over his philosophy of never forgetting to have fun, so simple, play. I try to embody play in everything I make whether it’s drawing the boot first on my leg, spinning a heel on it’s side or drawing 50 ridiculous shoes just to see where it takes me. Giving yourself the freedom to shut off the outside world and the inner negative chatter to just create (then later edit) is incredibly crucial to Dopp. Fashion is the second most polluting industry to big oil. We waste so many resources on trend chasing and I believe it's our relationship to things, especially in North America that's broken. With Dopp my intent is to create pieces that are handmade in the US with sustainable leather, wood, recycled materials, recyclable packaging that are timeless and long lasting, as to avoid this trash fashion that's become such an exhaustive beast. So that this, doesn’t have to be asked in the future. The Greta which is named after my grandmother was such a pleasure to create and by far the best seller.